Once you’ve selected a show your work really begins. There’s casting. Then rehearsing—staging the scenes and choreographing the numbers.You have to build the sets and costumes and rehearse the orchestra. And there are still a thousand other things that need to happen before the curtain goes up. 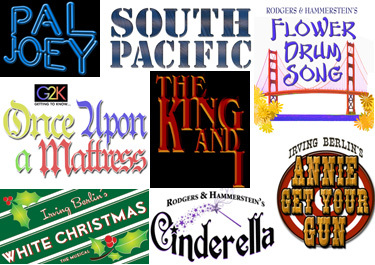 R&H Theatricals is always happy to help you choose a show. We are equally pleased to supply in a timely manner clean, well-formatted rehearsal materials which make putting on your show as easy as possible. But we want to do more. We know that one of your big projects is to create a logo for your show for use on posters, programs, print advertisements, etc., etc. It’s time consuming and it’s costly. Not anymore! 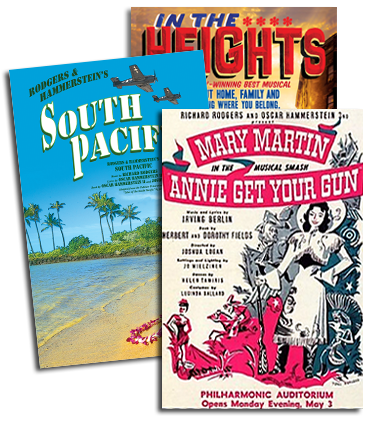 R&H Theatricals can now make available to you an approved and authorized logo for every title in our catalogue. Beginning February 17, 2009, we will include with every shipment of rehearsal materials—at NO ADDITIONAL CHARGE—a logo for the show you have licensed. The logo artwork will be provided on a CD and will arrive in plenty of time for use in promoting your production. The artwork is provided as a high-resolution JPEG file (where available). Some shows have many options for the appearance of the logo: in various colors, black and white, and vertical or horizontal orientation. If you decide to create your own logo, that’s perfectly okay. But the logos we provide must be used as is with no alterations. Our new logos are colorful, eye-catching, and are sure to attract ticket buyers. And don’t forget—for CUSTOM T-shirts, posters and program covers for many of the titles in our catalogue contact Stage Promotions: www.stagepromotions.com.